1. It is available to connect simulated human through scanning QR code with mobile terminal, which means there is no need to install any app on mobile terminal which could be mobile phone or tablet computer. It is available for both IOS or Android platform. 2. 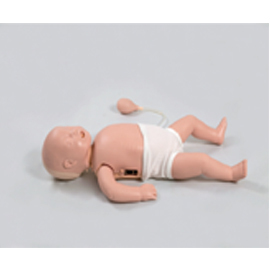 There is built-in lithium battery in simulated human, which supports outdoor CPR training or examination. 3. Operation process will be guided though voice prompt all the way during training mode. It is available to show compression, air blowing, circulation count and error message simultaneously. Error message includes compression interval, excessive compression, insufficient compression,too many times of compression, too little times of compression, insufficient rebound, wrong compression position, air blowing is too fast, blowing to stomach, blowing for several times, blowing for few times. 4. User could set up examination parameter of their own accord during examination mode, including examination duration, compression interruption time, compression frequency, compression accuracy, air blowing accuracy, fast air blowing, etc. 5. Check brachial artery reaction:pinch the rubber ball with one hand to simulate brachial artery pulses.